Notes: Lovely clear postmarks plus rare Britannia cachet added for good measure. 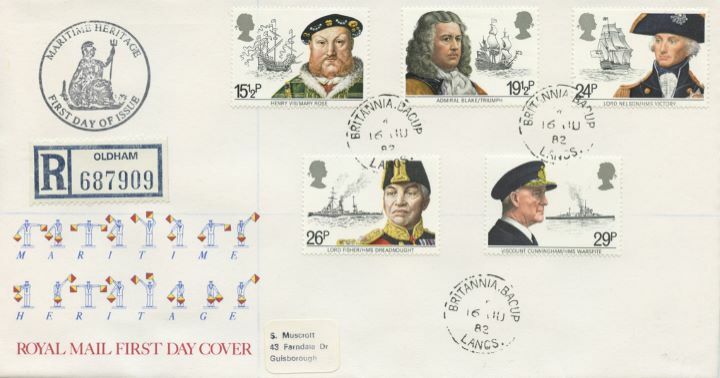 The above Royal Mail Maritime Heritage stamps were issued on 16 June 1982 by Royal Mail and feature the following stamp designs: 15 1/2p Henry VIII and Mary Rose; 19 1/2p Blake and Triumph; 24p Nelson and Victory; 26p Fisher and Dreadnought; 29p Cunningham and Warspite. The Rare Britannia postmark & cachet first day cover with the Britannia CDS Postmark postmark has been produced by Royal Mail/Post Office and features these stamps which can make a very collectible and lovely gift.